This procedure will not correct crow’s feet or other wrinkles nor lift sagging eyebrows. This can neither eliminate dark circles around the eyes. However, other procedures to correct these problems are also available. 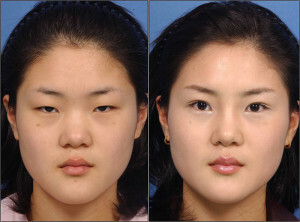 WHO WILL BENEFIT FROM EYELID SURGERY? 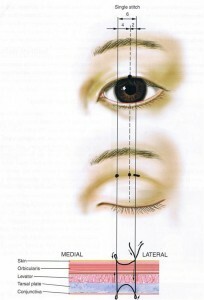 Patients with single lid and no excessive fats are best candidates for scarless double eyelid wherein 1 or 2 small sutures are buried from the tarsal fold to exit into the desired height outside. Chinese calls this procedure (“ting-sun”) which is believed in ancient physiognamy to bring good luck in business and marital life. This outpatient procedure usually takes 1 to 2 hours depending on the extent of the surgery. For droopy eyelid correction, an incision is made in a natural crease of the upper eyelid, approximately 3-5 mm above the lash line. Excess fat and skin are removed. If associated with sagging eyebrows, a forehead lift may be recommended. For lower eyelids, incisions can either be below the lower eyelashes or the “scarless” approach from inside the eyelid. Our Surgeon will discuss to the patient whichever is appropriate for his condition. WHAT KIND OF ANESTHESIA IS USED FOR EYELID SURGERY? General or local anesthesia with or without sedation may be used depending on the situation. CAN ALL FOUR EYELID SURGERIES BE DONE AT ONCE? Yes. In this case, the surgeon will most likely work on the upper lids first before proceeding to the lower ones. WHAT CAN A PATIENT EXPECT RIGHT AFTER THE SURGERY? The surgeon may lubricate the patient’s eyes with ointment after the surgery. Tightening and soring of the eyelids will be experienced as the anesthesia wears off. This pain and discomfort can be relieved by the prescribed pain medications. It is advised to have somebody to drive the patient home after the surgery. Majority of the swelling and bruising will be resolved within a week or two. Keeping the head elevated (on about 2 to 3 pillows) and using cold compress help reduce these specially during the first 3 days. On the 4th day, hot compress has to be done. To relieve the dry eyelid sensation and itching, eyedrops may be prescribed. During the first few weeks, excessive tearing, sensitivity to light, and temporary blurring or double-vision may be experienced. The stitches will be removed 2 to 7 days after the surgery. Some patients may feel some sensitivity to sunlight, wind and other irritants. Wearing of sunglasses and special sunblock for eyelids are recommended. WHEN CAN NORMAL ACTIVITIES BE RESUMED? After 2 to 3 days, you should be able to read or watch television. However, wearing of contact lenses may take for about 2 weeks or even longer until the patient is comfortable enough to wear them. HOW SOON CAN A PATIENT GO BACK TO WORK? Most patients go back to work 3 to 5 days after the surgery. However, for those with strenuous job, it may take 3 weeks. Some feel ready to socialize and go out in public in 7 to 10 days. 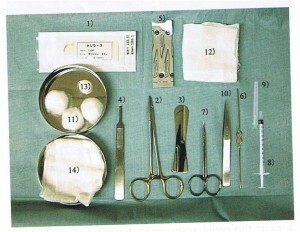 Make-up may be worn to hide the remaining bruises depending on the patient’s healing and surgeon’s instructions. HOW SOON CAN RESULTS BE SEEN? Healing is a slight process. Results can immediately be seen once majority of the swelling subsides in 2 weeks. The final result will surface in 3 to 6 months when all the swelling has resolved and skin contraction is complete. Scars may remain slightly pink for a while but will eventually fade until they become barely visible. CAN IT BE DONE SIMULTANEOUS WITH OTHER SURGICAL PROCEDURES? Eyelid surgery is commonly done in conjunction with a brow lift, face lift and nose surgery. WHAT ARE THE HEALTH AND MEDICAL CONSIDERATIONS PRIOR TO UNDERGOING EYELID SURGERY? Good candidates for this procedure are those who are generally healthy, psychologically stable and with realistic expectations. Patients are advised to inform the surgeon of their medical history, illness and medications. Of particular concern here are thyroid disease and eye problems such as glaucoma, lazy eye, retinal problems, cataracts and dry eye. Dry eye is characterized by frequent blinking, itching, red eye and burning – this problem can worsen with an eyelid surgery specially if proper measure such as canthopexy or canthoplasty are not taken. Eyelid surgery can cause dry eye and/or persistent swelling if done to those with thyroid disease. In this case, Our surgeon will require documentation and most recent thyroid function test. All surgeries carry some risks. Fortunately, complications are not common and usually minor with blepharoplasty. One of the complications is the inadequate correction of the problem which can be resolved with a minor additional procedure. Some patients may have difficulty closing their eyes when they sleep; in very rare cases, this condition may be permanent. Other complications include ectropion (downward pulling of the lower lid), dryness of the eyes, asymmetry, unfavorable scarring and infection.